How much will you pay to have power to your portable devices, everywhere and anywhere? If the answer is “Not very much,” you have never been stuck someplace with a dead gadget battery in a crucial situation. I’m fortunate to live in Tucson, Arizona, where it is sunny almost every day of the year, when it comes to using solar-powered chargers and batteries. If you live in a gloomy place should you stop reading now and turn on more lights? No. Keep reading. Nomad 7 is a go-everywhere portable solar panel with a built-in 5V USB output port. Place Nomad 7 in direct sunlight, connect a USB device or portable battery, and let the sun do the rest. Whatever device you are charging will have a battery indicator to let you know when solar charging is complete. The company’s claim that this product has a “foldable rugged design” is accurate. Nomad 7 folds up nicely when not being used, and its base material is tough canvas that is indeed “weather resistant.” A handy velcro-closing interior pocket is sized just right for most of the portable devices suitable for charging on the go. Camping, sailing, and canoe trips come to mind, as do picnics and outdoor parties. Once you have a solar charger handy, you’ll come up with many uses for it. Most full charges require less than four hours, as the company predicts. Make sure you read the user comments on the product page. 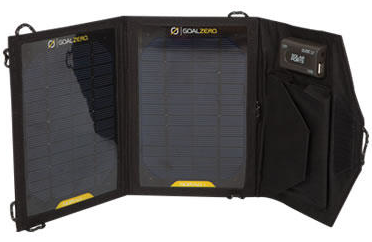 Goal Zero sells a supplementary battery and a speaker that are customized for Nomad 7. We didn’t receive these items for our phase one testing. 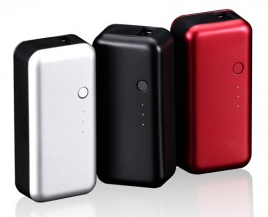 Just Mobile has three different portable battery charging products, the newest being called Gum, as opposed to its older and large siblings, Gum Plus and Gum Max. Perhaps they should have called the new baby Gum Junior, Gum Mini, or Gumicro, to avoid customer confusion. Gum is a tiny, portable, USB battery charger that ships with a single USB cable. It’s short, with standard flat USB at one end and micro USB at the other. A 30-pin Apple Dock Connector adapter is provided that fits into the mini end. Charge Gum using Nomad 7 or AC power or computer USB power, until all three of Gum’s LED indicator lights are illuminated in a couple of hours. Then charge your iOS and other USB-powered portable equipment until Gum is fully discharged and its LEDs are dark. What could be easier? Just Mobile Gum products hold their charges for a long time in storage, and they are efficient at charging external gear when connected. The latest little Gum has enough power to charge fully an iPhone, iPod, or iPod touch, but not an iPad. For that you’ll need the largest Gum Max. These chargers have only one purpose, and they do it well. Their European design is stylish and their engineering is top-notch. This smallest Gum is tiny. Several can be placed into a pants pocket, and three can fit snugly into the interior pocket on the Nomad 7, described above. Gum has a full set of instructions printed on its rear metal face, which is a nice touch. The combination of Nomad 7 and Gum is almost perfect. There is always room for improvement, but for a combined total of $150 you get solar charging, USB versatility, extreme portability, and off-the-grid technology. Strong recommendation for these products, used together or independently. MyMac Review Rating: 9 out of 10 both for Nomad 7 from Goal Zero and Just Mobile’s new Gum.